Don't ask him about his little red book. Just like Interstellaria, AntharioN happens to be another game I managed to back via Kickstarter yet not remembering how I originally found out about it. The first Kickstarter funding campaign was unsuccessful but the second one happened to successfully raise $22,508 (of a $10,000 goal) thanks to me (and 729 other backers ;)). AntharioN advertised itself as an old-school, turn-based, party-based RPG so it definitely piqued my interest (I love turn-based games). Tribute to classic RPGs: Despite the isometric viewpoint and cute graphics, the game actually reminds me of games like Ultima VI. Exploring the world is "tick-based" (i.e. NPCs only move one step when you move one step) and in combat you revert to turn-based mode. The game also allows you to build a custom party which reminds me of games like Wizardry or Icewind Dale. Music: The game has excellent music thanks to Eric J. Gallardo. His work on AntharioN actually sounds very similar to Jeremy Soule's work in the Elder Scrolls games. No mean feat! Turn-based: As already mentioned, the game is turn and tick based, so you can play the game at your own pace! 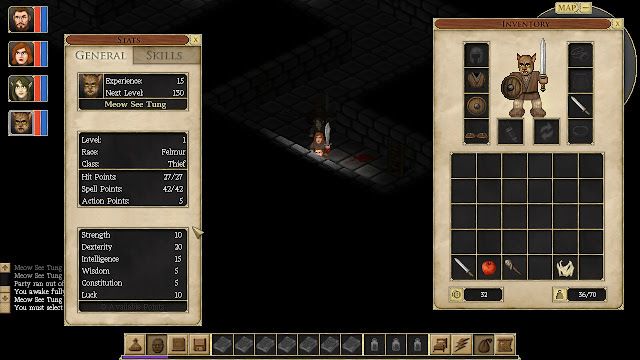 Not overly complicated: Unlike a lot of D&D CRPGs, the game isn't that complicated and has a fairly intuitive interface. You'll be able to figure out how 90% of the game works without needing to search for help. There are also preset classes you can choose from when creating characters for your party. No real explanation on how classes work: While you've got the typical classes you'd expect in RPGs sometimes it's dangerous in assuming they work the same way as RPGs you've played before. For example, I have a thief in my party and he seems to be pretty useless except for being able to pick locks. Apparently he's got some skill in pickpocketing but I'm not quite sure how you're meant to do this. Also can thieves sneak? Can they backstab? Or are they meant to be a ranged character? Some questions I don't have the answers to, yet. No manual: For many games nowadays, manuals aren’t really required but you still can’t really get away from it with RPGs, simulation or strategy games. Apparently one is in the works thankfully. Derivative plot: I haven't got far enough yet but seems to be your typical fantasy plot where an ancient evil is awakening and your intrepid party needs to stop it! Cumbersome trading interface: You can't at a glance tell what you can afford and what you can't. You also can't sort items in price or category order (they're all displayed in the shopkeeper's inventory) and there's no way to distinguish the stuff you just sold and other items. While the plot seems rather barebones at the moment and I haven't come across any memorable characters yet I am keen to explore the world of AntharioN and the turn-based, custom party RPG combat is a blast from the past which will keep me coming back for more. The developer is also continually updating the game to make it more user friendly (e.g. better explanations on what are ingredients and what are not, how difficult particular locks are, etc.) so that's always a good thing.